There's nothing quite like powering through a book super quickly when you have the opportunity to meet the author. Mindy McGinnis is hilarious, kind, and completely without a filter. Oh. And she's a librarian, which just makes her that much more awesome. Set in a dystopian future, water is scarce and living next to a water source can be dangerous. Lynn's life is a daily fight for survival. Trust no one. Give nothing. And be prepared to kill if someone steps onto your land. When her mother is killed in a horrifying accident, Lynn is on her own. She doesn't mind much. She has learned how to live in solitude, but when smoke can be see from the bank of the river not far from her home, everything changes, and over the course of the book she learns about loyalty, friendship, true family, and just how far she is willing to go to protect the things she loves. I didn't really expect to like this one as much as I did. 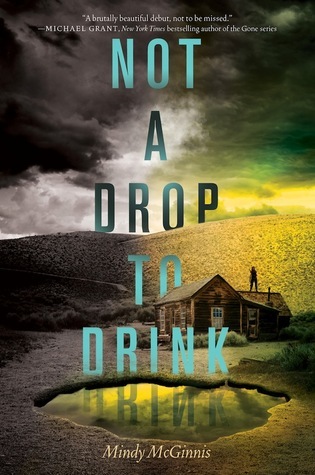 Not a Drop to Drink reads more like a western than a dystopia. In fact, there were several times I had to remind myself that it wasn't actually set in the west. I think that was part of the reason it resonated with me. There was a familiarity and a wildness about the story without being apocalyptic. Lynn is confident, stubborn, and fierce. She has to be in order to survive. I read a few reviews on Goodreads that dismissed the love interest in the story, deeming it as unnecessary and diminishing Lynn's abilities, but I disagree. The Lynn at the beginning of the book would not have reacted to events later in the story without that love. It was how she grew, but if the end showed anything, that love only made her more of a reckoning. A fast-paced survival story with a strong, yet likable, female lead. And a really cool neighbor.